Over the 16 years of UKOLN’s annual IWMW event we have always valued the importance of user feedback for the event and this year is no exception. 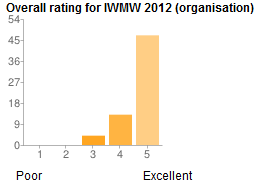 When the rain stopped on the opening morning of the IWMW 2012 event I had the feeling that this year’s event would be special – and the analysis of the evaluation forms confirms my suspicion. There were a total of 172 participants at this year’s event and we received 64 completed evaluation forms. As can be seen from the accompanying histograms, no fewer than 73% rated the organisation of the event as Excellent, with 41% regarding the content as excellent and 50% regarding the content as Very Good. The highest ranked plenary speaker was Rob Borley. His talk which asked “Do I Need an App for That?” scored 4.42 (on a scale of 1=Poor to 5=Excellent). The other highly ranked plenary speakers were Keith Doyle and Paddy Callaghan, whose talk on “Serve Two Masters: Creating Large-Scale Responsive Websites” received a score of 4.32; Stephen Emmott whose talk on “Measuring Impact” received a score of 4.32 and Dawn Ellis whose talk on “What Do You Really Want?” received a score of 4.24. It was also pleasing that all of the plenary speakers received scores of Very Good or Excellent. Very good range of speakers in plenaries and interesting parallel sessions. First time at IWMW – excellent conference, great speakers. Was a bit scared that, as a learning technologist, the content would go completely over my head. Was pleasantly surprised that I understood much of the content so kudos to the presenters for putting their ideas over in a simple way. Very well organised event, working like clockwork! Really well organised and a big shout out to the catering staff who rustled up some lovely gluten and dairy-free lunch for me! very smooth, under 1 roof, the technology worked well. “Spectacularly organised as ever. Everything seemed to run really smoothly from meeting up with everyone on the Sunday to getting bits and bats for our session to lunches and so on. I liked the central venue which was easy to find and get to by public transport. The venue this year was excellent. The space available (both accommodation and conference space) were of a high standard. The food should get a special mention. The only slight downside was the distance between the accommodation and the conference. It was nice to see a mix of old and new attendees and I know from talking to some “”newbies”” they really saw the value of the community.